Today we visited the optician for an eye test. B is 4 and it was her first time at the optician, but 7 year old E has been for two annual check ups since he started school. In hindsight, a Friday afternoon after a busy week of school was not the best time to visit. Both children were tired and I could see E's eyes blinking a lot when we arrived, which made me think that maybe he did have a problem. However, my anxiety was misdirected and the excitement of the trip meant that both were alert and happy to try something new and different. E went first, so B could see what would happen. 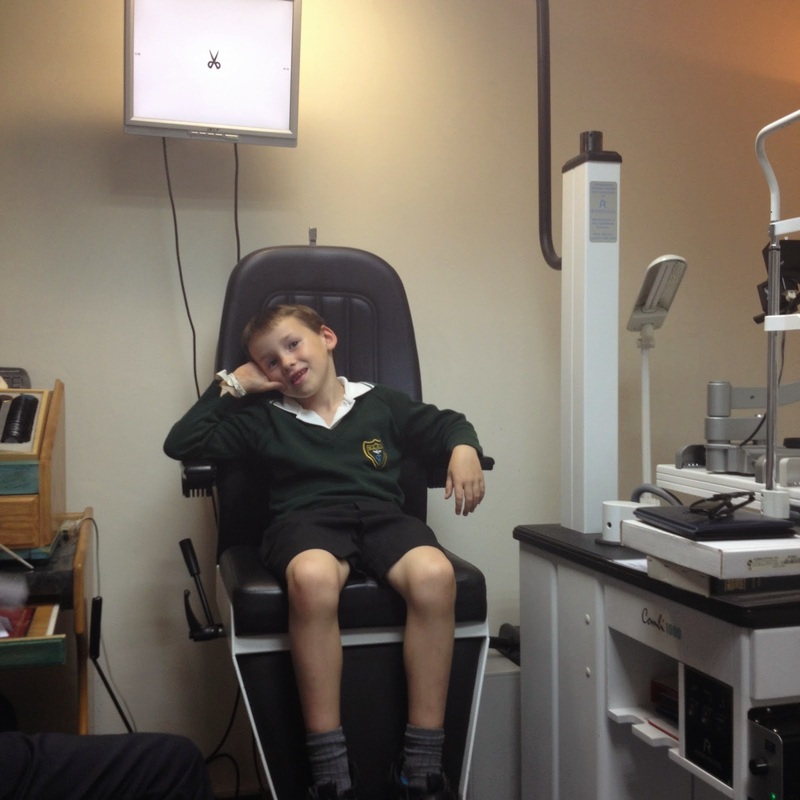 He climbed into the chair and was very excited when the optician pressed a button and made it go up in the air. After chatting about school and whether he could see the whiteboard well and whether he had any problems watching TV, his first job was to look at several lines of letters, which he correctly identified, even as they got smaller and smaller. Things got a little more difficult when the optician covered one of his eyes, and then the other, and asked him to read out the letters, but he still got them right. The next image on the monitor in the mirror was a pair of magic scissors, which suddenly turned into a duck. E shouted with joy when he spotted the change. He was then asked to wear a special pair of 3-D glasses and try to touch the wings of a fly, which he thought was great fun. The colour test was next when E was shown a special book of numbers hidden in coloured dots and he had to say which numbers he saw. Next, he was asked to follow the optician's pen with just his eyes, not his whole head. Then he had to watch a picture of a clown on the wall while the optician used various lights to look inside his eye. Finally, all the lights went out as the optician took a closer look inside his eye with his special torch. He did so well at all the tasks, he was given a special shiny sticker. Then it was B's turn. B is not yet reading, so she was given a special card with the letters on and asked to match a single letter on the monitor in the mirror to one of the letters on her card, which she thoroughly enjoyed. She then had a go at most of the exercises her big brother had done and as the test continued she grew in confidence and got quite chatty with the optician. He was very impressed with her number recognition. At the end, she even took the sticker - not something she would normally do, even at the dentist or at the doctor's surgery after her immunisations. Both children have great eyesight, with a slight tendency to longsightedness, which is normal at this age. They will go back again in a year. If E is still good, he will then only have to go every two years as the longsightedness tends to correct itself by the age of eight as it's just the normal development and growth of the eye, rather than a problem. 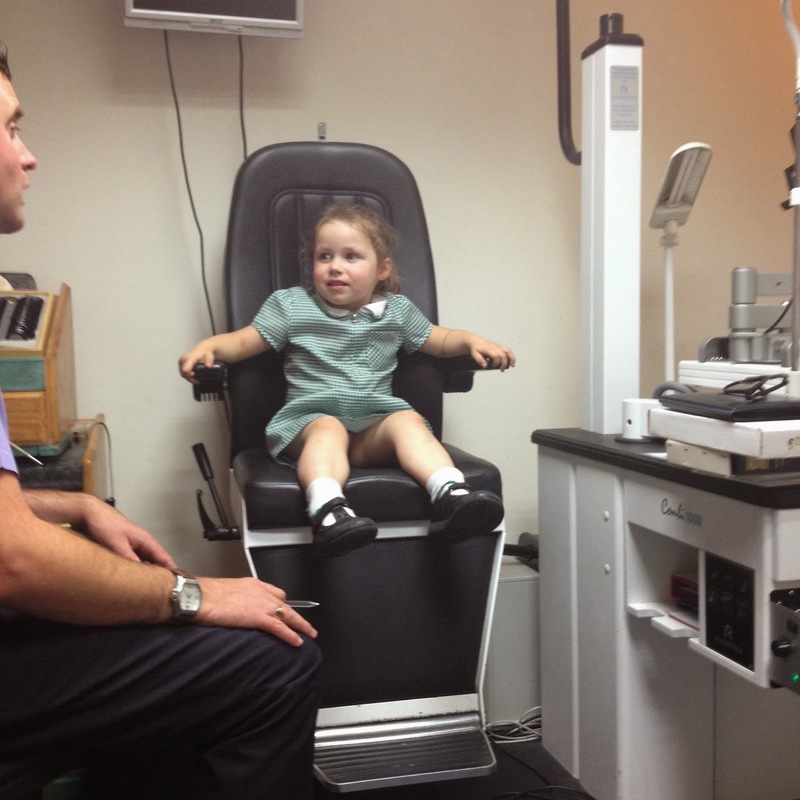 Eye tests for children are free on the NHS and the earlier any problems are spotted, the better the outcome. It's particularly important to get your child's eyes tested when they start school because it can be difficult for them to learn if they can't see the whiteboard. Also, if they are struggling to see the words in a book, it can impact on their ability to read and learn, which can lead to behaviour issues. We visited Bill and Taylor on Station Road in Teignmouth. I had previously taken Elliot to a high street chain, which was great. But I am going through a phase of trying to shop locally at the moment, so I decided to try a local, independent optician instead. The optician was brilliant with the children and explained what he was doing throughout, reassuring them, chatting to them and making it a really fun experience. In fact, I was so impressed, I think I might book an eye test for myself with them in the very near future. Apparently, your eye sight can start to deteriorate from around the age of 40 and I'm rapidly approaching that age now! rapidly approaching 40!? Not yet Mrs.